"Wildlife are an invaluable renewable resource that developing nations must learn to utilise judiciously, so that their benefits accrue today but in such a manner that future generations shall inherit with pride the legacy of previous generations. This will not be achieved by banishing the indigenous wildlife guardians from the land of their birth, and relegating them to marginal areas where impoverishment and deprivation will become their lot." "Nature preserves ... are not places to be saved to be used at a later stage when an ever-growing human population claims more land because of lack of economic development." "Why can our animals not go there [to the Park] while the Park animals can come here?" This is the story of where all our human ancestors probably came from: Africa, particularly the savannas of Africa. Over millions of years, these savannas gradually replaced forests and woodlands in some places, and hominins (including ancestors of humans) took advantage of these new environments. In these savannas are the oldest known footprints of hominins walking upright, a habit that freed our ancestors' hands for carrying, digging, and throwing. Here, our ancestors probably crafted their first tools and hunted and scavenged wildlife. And as far as we know, it is from here, millennium after millennium, that our forebears repeatedly left Africa and populated other parts of the world, eventually becoming the ancestors of all humans. To the best of our knowledge, every person who reads these words has australopithecine ancestors who lived in Africa. Remarkably, this ancient home of humankind is also the setting for a unique story of people and wildlife who have lived side by side throughout thousands, perhaps millions, of years. Africa alone more or less escaped the massive extinctions of large mammals that occurred in the Pleistocene epoch. Today, only African savannas continue to maintain a startling diversity of large mammals. These large mammals thus thrive best not where they have been separated from people over the millennia, whether by accident of geography or history, but rather where people have lived on this planet the longest. This book is partly about why this is so. Since the late 1800s, this ancient coexistence of people and wildlife in African savannas has often been ignored, often replaced by a modern practice of conservation which assumes that wildlife are best conserved in landscapes with no people. Colonists from southern Africa and the West imported this idea into east Africa to stem wildlife losses caused by colonial and African hunting. Rooted in a Western philosophy of the Middle Ages that separated people from nature, this new belief contrasted sharply with the belief in many cultures of Africa, Asia, and the Americas, which viewed humans as part of nature, interconnected and interdependent. Most colonial governments, and some African governments that followed, carved out large pieces of the savannas to create wildlife parks and reserves, most of which banned people from their traditional lands within the parks. Even though these parks today cover only about 9 percent of savannas across east Africa, they were often created where most species congregate in the dry season and in drought, places critical to the survival of wildlife and people alike. Despite the creation of parks to protect wildlife, many large animals in Kenya and some other countries today still live in savannas outside parks, where they share their habitat with people. Why is this so? One obvious reason is that there is about ten times more savanna land outside than inside parks. But another, less appreciated reason is that some communities located outside parks have chosen to live with rather than exterminate wildlife. This is particularly true where low and variable rainfall make settlement and farming difficult; as a consequence, people often use the land in a way that keeps the land open for wildlife. Remarkably, the people who coexist with wildlife in these savannas are not just wealthy wildlife ranchers or tax-funded national governments with significant funds to support those wild populations. Many are herders, far poorer than nearby farmers, pursuing a pastoral lifestyle that has been common in these savannas for thousands of years (Figure 1). These contradictions have created two camps of outside observers, one supporting pastoral development and one supporting wildlife conservation. On the one hand, many social scientists and development practitioners see efforts to conserve wildlife through establishment of parks as a violation of both human and land rights and one cause of poverty. Across Africa many people still live in these parks, and an estimated 1 to 14 million people would have to be displaced to enforce the rules governing human populations within these protected areas. In African savannas, these parks are usually on land that hunter-gatherers and herders have used for thousands of years. Even in conservation areas where pastoral people are allowed to live, such as Ngorongoro in Tanzania, research shows that herders become impoverished when conservation policy requires they live mostly off their livestock, by restricting their ability to grow crops. And local residents, particularly those who are poor, often experience most of the costs and few of the benefits of living near parks and conservation areas. The creation of protected areas denies local people the option of using this land in other ways in the future, which could limit their economic growth. These realities create critical problems in African savannas. On the other hand, many conservationists see parks and reserves as critical to conserving wildlife in Africa and as ecological baselines for measuring how people affect wildlife and savannas. As the human footprint grows in savannas outside protected areas, they are pointing to a long-term loss of wildlife and a rise in human-wildlife conflicts. In Kenya, for example, wildlife populations fell by as much as 80 percent in some savannas between the 1970s and 1990s. Around Kenya's Amboseli National Park, some elephants die at the hands of spear-wielding herders, especially during drought when elephants and cattle compete for limited food and water. In the wildlife reserves of Karamojong, Uganda, armed herders are a major cause of wildlife loss. In Tanzania, aerial surveys suggest that wildlife declined in the decade from 1990 to 2000 both in and around many protected areas, although elephant populations grew. In all of these cases, people, and sometimes herders, are a likely cause of wildlife declines. These realities also create critical problems in African savannas. Underlying these views are conflicting values. From a human (or anthropo-) centric perspective, the health and welfare of people are most important and their needs should be served first. Nature has value because it provides people with material benefits; thus, conserving natural resources has value because it affects people's well-being. In Western societies, this view typically emphasizes the individual, whereas in many African societies it focuses on the clan, community, village, tribe, or nation. A contrasting, ecocentric point of view maintains that nature has value for its own sake, apart from how nature affects humans, and deserves moral consideration as such. People holding this view can appear indifferent to human welfare, seeming to consider conserving nature more important than feeding people. When people argue either for the development of pastoralism or for nature conservation, the argument often is about who should come first, people or nature. The Western philosophy of people's separation from nature typically underlies these dichotomies, which may explain why the divide is both large and seemingly unbridgeable. What do pastoralists in east Africa think about the separation of people and nature-about people first or environment first? Scholars, whether from Africa or elsewhere, have written very little about this subject. The Oromo herders of Ethiopia (included with the Borana and Arusi on Map 4) depend on the land for food, shelter, and fuel, but they also view the environment spiritually and morally. Philosopher Workineh Kelbessa describes it this way: "For them, land is not only a resource for humans' utilitarian ends, but also it has its own inherent value given to it by Waaqa (God). For the Oromo, Waaqa is the guardian of all things, and nobody is free to destroy natural things to satisfy his or her needs." Anthropologist David Turton describes how Mursi herders in Ethiopia (included with the Suri in Map 4) regard wild animals: "They kill them to obtain economically useful products and, when necessary, to protect their cattle, but otherwise their disposition is, as Evans Pritchard ... writes of the Nuer, 'to live and let live.'" I have had many conversations with Maasai about this, and they take pride in their long-term stewardship of savannas; many clearly think that people and wildlife are meant to live together. Animal characters feature prominently in Maasai oral history and stories, as both bad and good examples of behavior. Maasai schoolchildren see parks as places that attract tourists, provide income, and protect people from wildlife and wildlife from people. Thus, while pastoralists are certainly human-centric, they also respect, or at least tolerate, wildlife and consider themselves a part of the life of the savannas around them. In a sense, the pastoral view falls somewhere in the middle ground between support of human needs on the one hand and wildlife conservation on the other. Recently, the pastoral middle ground has been growing in influence among nonpastoralists, as those occupying this terrain attempt to move beyond an either-or view of people and wildlife and try to understand, rather, how people and wildlife coexist in the savannas and how they do not. The solution does not lie in a compromise of the extremes, however, but in the creation of a productive third way. Instead, it is critical that this third view recognize and address the real difficulties that pastoral families and wildlife face living with each other, and the inherent contradictions of this course: the fact that people have lived in savannas for millennia with wildlife and that wildlife are now fast disappearing; the fact that wildlife conservation policy can impoverish local communities and that agricultural development policy can harm wildlife populations; the fact that pastoral herders can coexist with wildlife and that they can extinguish wildlife. This book is about making sense of these contradictions-understanding how they came about in the first place and how they may shape the future of savannas. But why look to a middle, more pastoral view for solutions? Aren't herders the problem, overgrazing pastures and causing desertification? As a matter of fact, new evidence suggests that the story is far more complicated, emblematic of the middle ground. Take the following examples of this shifting, and often conflicting, narrative. Once, scientists thought the Sahara Desert was marching south into the Sahel; now, that transitional zone appears to be greening again. In the past, scholars thought African pastoralists were irrational and even greedy to increase the size of their herds; now, many view periodic herd growth as a sound strategy for coping with recurrent drought. Once, overgrazing by herders was thought to cause bush to invade grasslands; now, evidence suggests that CO2 generated by burning fossil fuels (mostly outside Africa) may also encourage bush to spread. In the past, scientists alone defined and measured savanna decline and degradation; recently, however, scientists have begun to include the observations of pastoralists in this undertaking. Whereas scholars once thought that communal grazing damaged rangelands, they eventually realized that herders create rules-of-use that in fact sustain rangelands; now, though, even some pastoral leaders are saying that their communities are overstocking their lands. Some people think that parks protect biodiversity, while others consider those same parks a violation of human land rights. To some, pastoralists destroy biodiversity; to others, they are the hope for conserving it. This book assesses the scientific merits of these points of view and attempts to take this discussion to a third place, somewhere in the elusive middle ground. The story of people and wildlife in African savannas is set within a much larger story of how people develop and live within their environment around the world. By most measures, the human condition is improving. The average child on Earth grows up in a family that is wealthier, better nourished, and better educated than that of their parents. There are now 100 million more adults who can read these words than could twenty-five years ago. Today, 2.1 million more children live past the age of five than they did just fifteen years ago. Since 1800, the percentage of people on Earth who participated in electing their governmental leaders rose from 2.5 to 45 percent. We eradicated two major diseases, smallpox and rinderpest, that used to cause sweeping epidemics in people and animals. We invented a worldwide system of parks to protect wildlife, plants, and ecosystems for present and future generations of people. A measure of our success, and a cause of our current undoing, is the sheer number of people alive today on Earth: about 7 billion-almost two people for every year the planet has existed. But not all people share in this wealth, health, and education. The world is now more inequitable than it was just one generation ago. Nearly half the people on Earth, some 2.8 billion people, live on less than $2 per day. Almost half the population of Africa, 300 million people, lives on less than $1 per day, and incomes are stagnant or falling. Directors of major corporations are paid as much as 30,000 times more than some of their rural African clients who walk several kilometers to buy corporate products in small village shops across the continent. The world's five hundred richest people together make more money than the 416 million poorest people. In 2004, for every child that died before the age of five in the world's wealthiest countries, thirty children died in sub-Saharan Africa, more than double the difference that existed in 1980. Belgium has about 450 doctors for every 100,000 people in the country, Rwanda only 4-less than 1 percent of Belgium's number. These disparities tend to be even wider where women are concerned. For example, although there are fewer illiterate people in the world today, two-thirds of those are women. One might wonder, given these facts, how well people in the richest countries are able to understand what it is like to grow up in the poorest countries, and vice versa. We accomplished many of these gains in human well-being by turning the Earth's riches-minerals, soil nutrients, water, animals, plants, fossil fuels-into food, fiber, and consumer goods. Over the last century, the industrialized nations focused on growing their economies and did so with spectacular success, assuming they could figure out how to solve any social, cultural, or environmental problems later. When in the 1980s it became clear that development could be sustained only if it purposefully addressed environmental and social as well as economic problems, "sustainable development"-the idea that our future survival depends in part on a healthy environment-was born. Few contest this idea today, and the understanding of our dependence on the environment, and of how strongly we can affect it, has deepened considerably. For example, we have understood for millennia that most of our food, clothing, and other essential material goods depend on the environment: soil nutrients, water, fuels, a diverse and abundant plant and animal life, and other natural resources. What has become clear only recently is the importance of a much wider range of "ecosystem services" that maintain the climate, provide clean water, pollinate crops, and even hold genetic information in store for future generations (in the form of biodiversity). This new understanding of ecosystem services reveals the tremendous economic cost of historical development. In fact, the value of the services provided to humans by all the Earth's ecosystems each year is larger, probably much larger, than the sum of all the gross national products (GNPs) of all the Earth's nations. For example, the services-such as timber production, flood control, and climate regulation-provided by an intact rain forest in Cameroon are worth more, in purely economic terms, never mind ecological, than forest cleared and planted for farming. Simply put, the foundation of human livelihoods is built on a diverse and resilient supply of the manifold services of nature. It turns out that biodiversity, like the wildlife discussed in this book, is the cornerstone of not only economic services but cultural, social, and aesthetic ones as well. This cornerstone that is biodiversity is eroding away. Humans now dominate most of the Earth's ecosystems, altering the Earth's life support system at scales from genes to species to ecosystems. Our best estimate, as indicated by the fossil record, is that species are disappearing a thousand times faster today than they did during the millions of years before our species migrated out of Africa. Most of this loss of species diversity is caused by converting land to agricultural production and settlements, introducing nonnative plant and animal species that often outcompete native species, and overharvesting plants and animals. As people convert land to more intensive farming and livestock raising, they inadvertently create ideal conditions for new infectious diseases to arise in wildlife, livestock, and people; these diseases, in turn, can kill yet other species. And global warming, caused by greenhouse gases emitted into the atmosphere by human activities, is shifting species into new habitats, some already heavily used by people for other purposes. Drylands, home to most of the Earth's savannas, seem to have more than their share of human and environmental problems. Of the major ecosystems around the globe, drylands, along with the cold lands near the poles, have the least rainfall and thus are the least productive. Mostly because of this, the gross domestic product (GDP) of global drylands is about $4,500 per person per year, lower than anywhere else on Earth (and African dryland GDP is even lower). Infant mortality is highest in drylands. And these trends are intensifying. Between 1990 and 2000, human populations grew faster in drylands than anywhere else. Drylands and the people who inhabit them are expected to be most affected by future water scarcity and climate change. And the dryland countries ranking lowest in human development are in Africa. This book is about relationships between people and wildlife in east African savannas, which can vary from synergy to measured tolerance to conflicted coexistence to full-blown conflict. I investigate the extremes of human-centric and ecocentric points of view and the important "eco-human-centric" middle ground that is opening up between them. I focus on the two-way interactions between pastoral people and wildlife but also make some comparisons with hunter-gatherer peoples, farmers, townspeople, and other groups. I also venture beyond Africa's well-known large wildlife to explore how herders and their livestock affect savanna insects, smaller mammals, plants, water, and soils. Many people associate the term East Africa with the three countries of Uganda, Kenya, and Tanzania; I use the term east Africa in this book more broadly, however, to refer to ten countries (see Map 1): Burundi, Djibouti, Eritrea, Ethiopia, Kenya, Rwanda, Sudan, Somalia, Tanzania, and Uganda. While all general references to east Africa in this book refer to this ten-country region, four case-study chapters (8-11) focus on the wildlife-rich Maasailand of southern Kenya and northern Tanzania, where I have lived and worked for more than two and a half decades. A fundamental assumption of this book is that people are part of ecosystems. Evidence from prehistory and history, as we will explore later on, suggests that people have had some role in creating and maintaining savannas over millennia. And people, by hunting, farming, and spreading diseases, affect savanna plants and animals deep inside "protected areas" today. I also assume that the rights of people living with wildlife are as important to consider as the rights of those who live outside pastoral lands within the same nation or in other parts of the world. I assume that conservation of wildlife, while good for the globe, should also be good for the local neighborhood. I assume that people are not the only species with rights, that nonhuman species have a right to thrive and survive also. And I assume that there exist elusive but practical win-win situations that can help local people to meet their changing aspirations and needs while conserving the wildlife around them-and further, that it is in the self-interest of all nations that this happens. 1. How do savannas and pastoral societies work? Is there anything special about the region of east Africa in a story about wildlife, people, and savannas? These topics are explored in Chapters 2 and 3. 2. Chapter 3 starts by asking: How do people who hunt, herd, and farm affect African savannas today? The focus then narrows to herders and wildlife and explores the costs and benefits of their coexistence. 3. What does the past tell us about current relations, whether in balance or in conflict, between wildlife and pastoralists?Chapters 4 and 5 review the evolution of savannas, wildlife, and (proto-)humans throughout Earth's history, focusing on the last 4 million years, from the Pliocene epoch to the mid-twentieth century, in east Africa. 4. Do today's pastoral peoples do more than coexist with wildlife? Do they in fact enrich savannas for wildlife?Chapter 6 focuses on recent research which suggests that in some savannas, traditional herding not only is compatible with wildlife but may indeed attract wildlife to pastoral lands. 5. When and why does coexistence break down into conflict?This is the topic explored in Chapter 7. More generally, are Africa's savannas being irreversibly "degraded," as is widely believed?If so, who (or what) is most responsible? 6. Chapters 8-11 present case studies that explore how pastoralist-wildlife issues are being played out in savannas of east Africa today.The focus here is on four savanna ecosystems across Maasailand in Kenya and Tanzania where pastoral culture is changing at unprecedented rates, herding can no longer meet all family needs, and large wildlife, though in some areas on the decline, is still generally abundant in both numbers and diversity. 7. The book concludes by proposing answers to two questions: What are the most likely future scenarios for pastoral people and wildlife in the savannas of east Africa? And is there a path to the middle ground that promises a more resilient future for both? 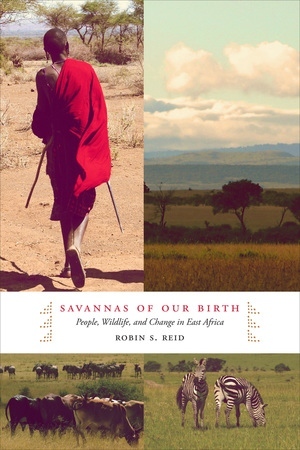 This book tells the sweeping story of the role that East African savannas played in human evolution, how people, livestock, and wildlife interact in the region today, and how these relationships might shift as the climate warms, the world globalizes, and human populations grow. Our ancient human ancestors were nurtured by African savannas, which today support pastoral peoples and the last remnants of great Pleistocene herds of large mammals. Why has this wildlife thrived best where they live side-by-side with humans? Ecologist Robin S. Reid delves into the evidence to find that herding is often compatible with wildlife, and that pastoral land use sometimes enriches savanna landscapes and encourages biodiversity. Her balanced, scientific, and accessible examination of the current state of the relationships among the region’s wildlife and people holds critical lessons for the future of conservation around the world. Robin S. Reid is Director of the Center for Collaborative Conservation and Senior Research Scientist in the Natural Resources Ecology Lab at Colorado State University. 4. Moving Continents, Varying Climate, and Abundant Wildlife: Drivers of Human Evolution? 6. Can Pastoral People and Livestock Enrich Savanna Landscapes? 8. The Serengeti-Mara: “Wild Africa” or Ancient Land of People? 10. The Kaputiei Plains: The Last Days of an Urban Savanna?